I love cinnamon buns, in fact I love any kind of bun with a filling and some icing on top. I made these buns, filled with dried cherries and cranberries, cinnamon and brown sugar, and with a drizzle of lemon icing on top. My last post sang the praises of baker James Morton and his book Brilliant Bread. Click here for the link to buy from Amazon. And I still revere Paul Hollywood‘s words of wisdom on all things bread. So I made my buns with a little bit from each baker. The recipe is an enriched bread dough (butter, milk and egg added to the basic dough). Because I now have a spectacular sourdough starter, as well as instant yeast, I added a little of my starter for some extra flavour. 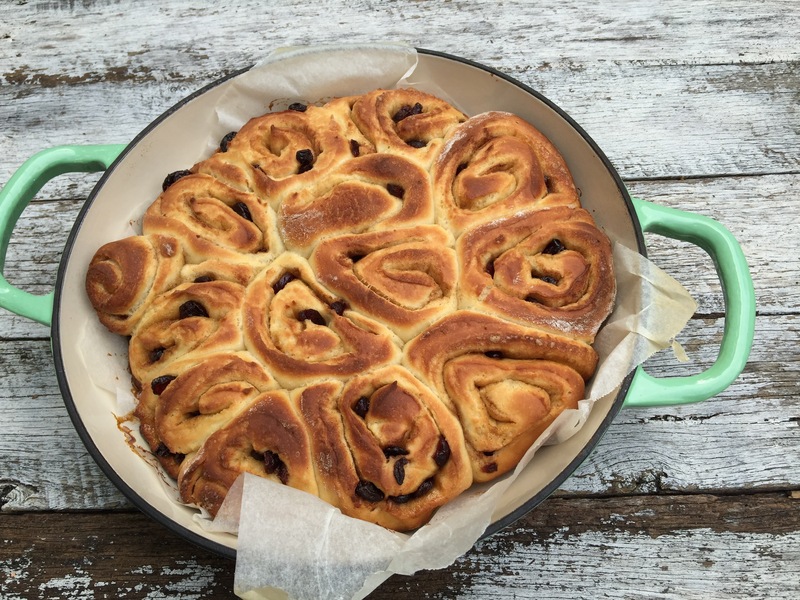 James recommends baking the buns in a cast iron casserole eg a Le Creuset dish. 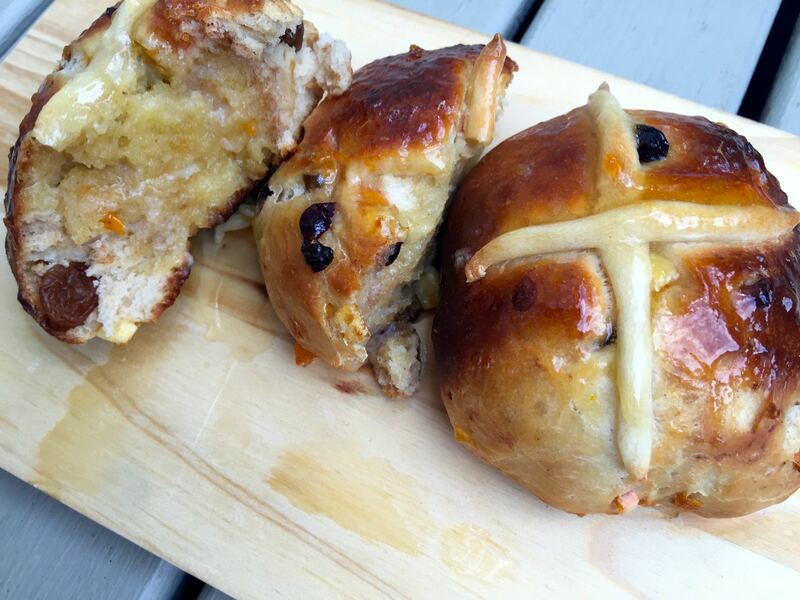 Cooking them in a pot creates lovely soft buns. Place the flour, salt, yeast, sourdough starter if using, sugar, tepid milk, and egg into a large bowl and mix them together by hand or you can use an electric mixer with a dough hook. Knead by hand or in the mixer about for 10 minutes. Turn your dough out onto a lightly floured surface and roll it out into a big, long rectangle. The rectangle should be about 20cm wide and up to a metre long. 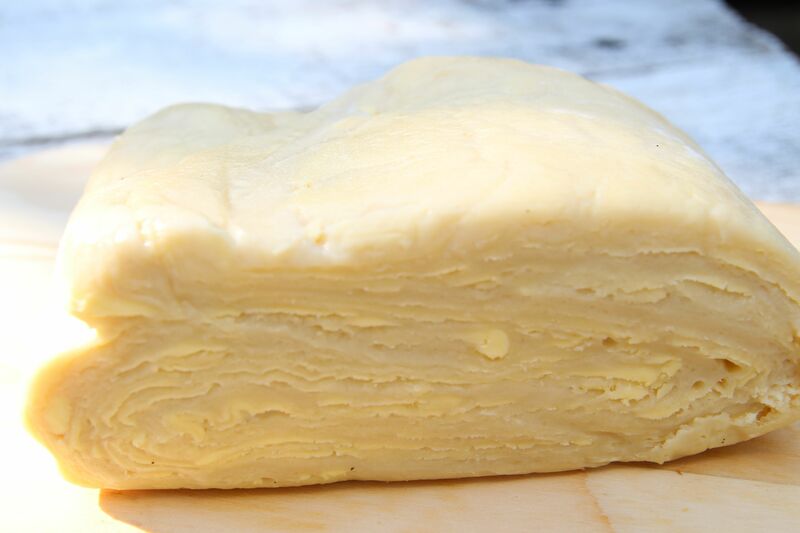 Melt the 50g of butter and brush over dough. Sprinkle the dough all over with brown sugar and then cinnamon. 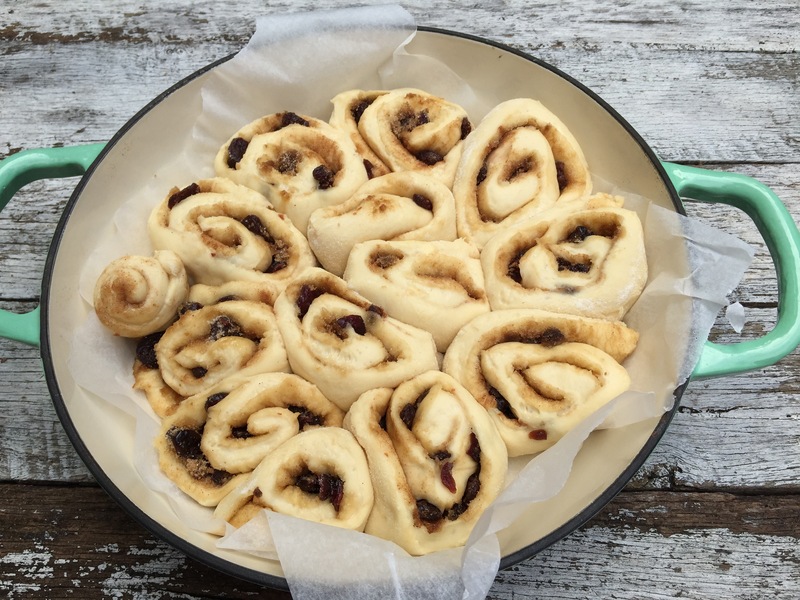 Scatter the cherries and cranberries over the dough. Roll up the dough along its long edge into as tight a cylinder you can get, but be careful as the dough is quite fragile. Slice this cylinder into 6-9 roughly equal pieces using a knife. Line a large lidded casserole pot with a piece of baking paper and arrange the buns cut end down. Place the lid on the casserole and leave to rise for another hour at room temperature, then check to see that buns have risen. 30 minutes before baking, preheat your oven to 180 degrees C fan forced. Put the lid back on the casserole and place in the oven. Cooking time seems to vary – James says 40 minutes lidded then another 10 minutes with the lid off. He says if the casserole is thinner walled, they’ll probably bake quicker. My buns took about 25 minutes with the lid on and 10 minutes with the lid off. As you can see from the photo, my buns browned too much, so I will need to watch the cooking time carefully when next I bake. Remove from the oven, and brush with the apricot glaze while still warm. Cool to room temperature. For the lemon icing, mix the lemon juice and icing sugar until thick but of dropping consistency. Drizzle over the buns using a fork or spoon. 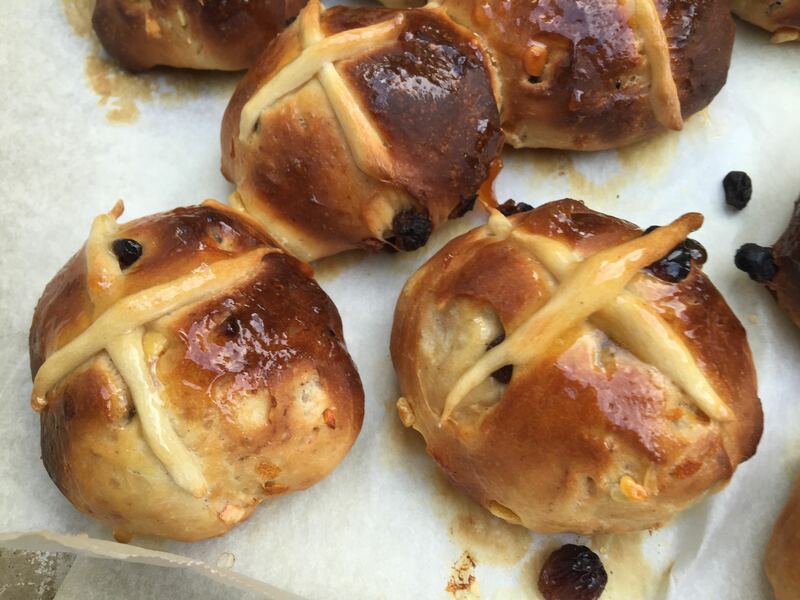 Posted in Bread, Breakfast, Buns and Scrolls, Small Baked Things, Sweet Food and tagged enriched dough, James Morton, Paul Hollywood, sourdough starter. Bookmark the permalink. Continuing my exploration of laminated pastry making, I made a batch of croissant dough. 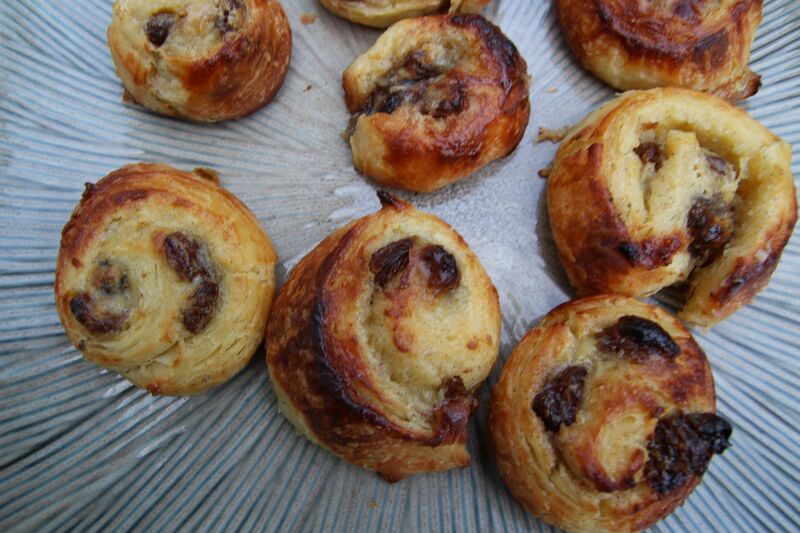 The recipe is very similar to that for Danish pastry. 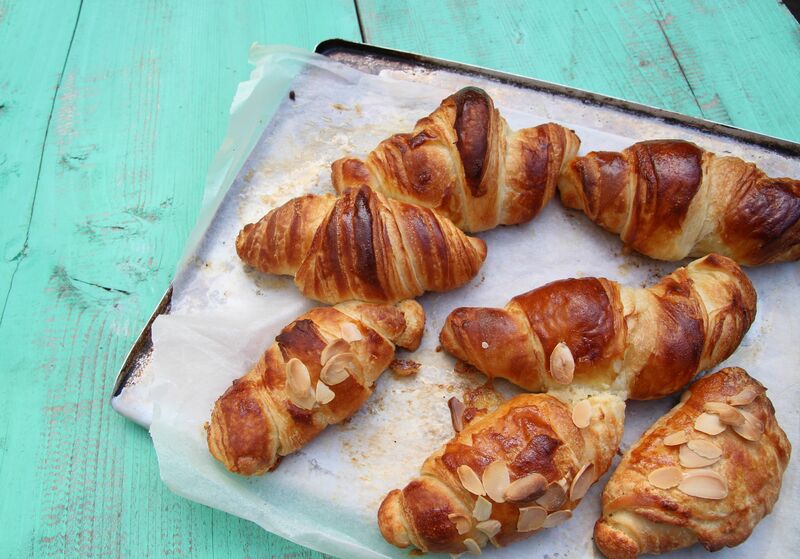 I followed Paul Hollywood’s recipe for croissants from his well written and very informative book How to Bake. 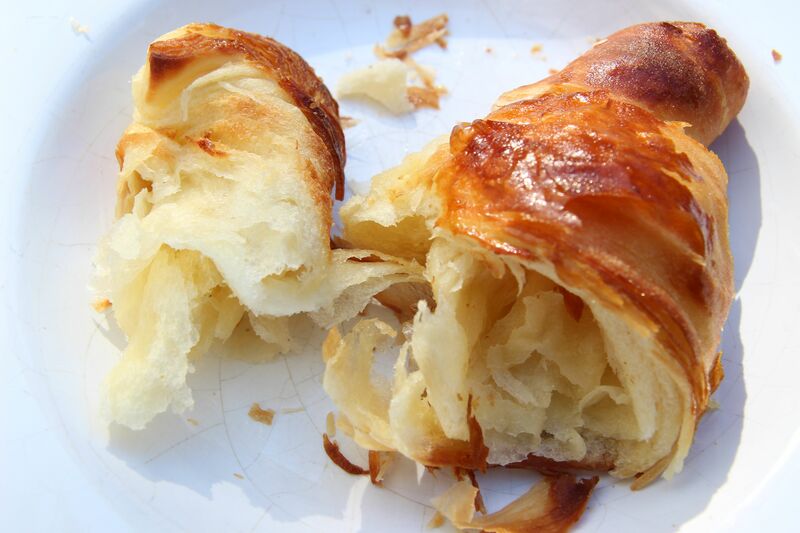 For croissant dough, you omit the eggs for a lighter, flakier pasty. I substituted semi-skimmed milk for the water in the yeast dough, following a recipe for croissants from another great book, Great British Bake Off: How to Bake: The Perfect Victoria Sponge and Other Baking Secrets. 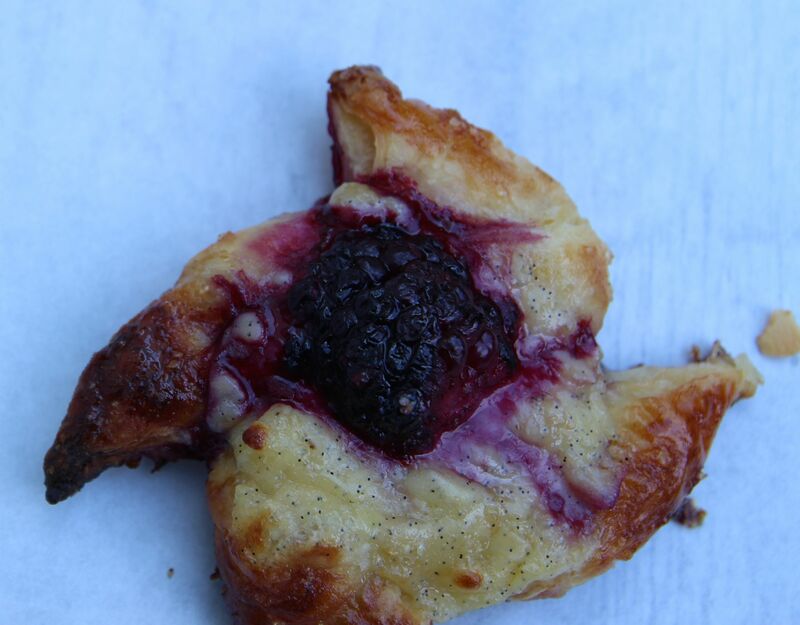 I was very happy with the results – light, flaky croissants and Danish pastries that were equally as delicious as my first version. But note: Omit the eggs. Use 300ml semi-skimmed milk in the base dough instead of water and full fat milk. 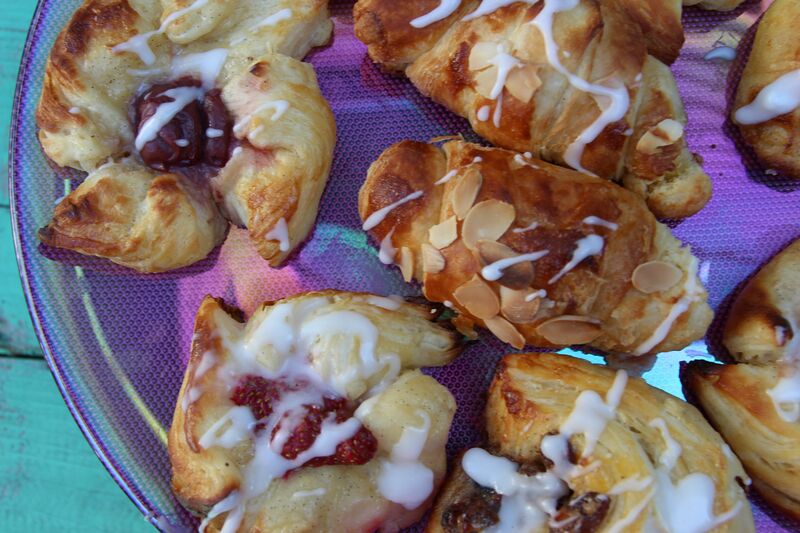 I made croissants, almond croissants, pain aux raisins and cherry and strawberry danishes. Here are Paul’s instructions for how to shape the croissants – the quantities refer to using the whole amount of the dough. 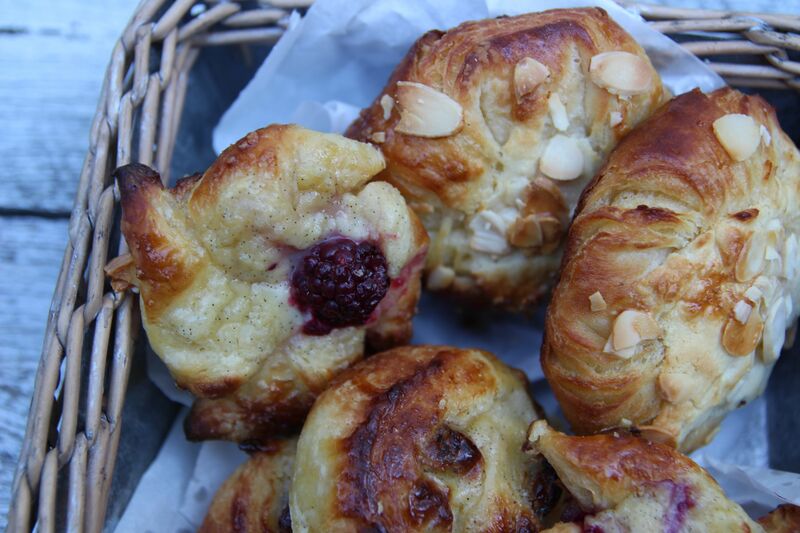 To make almond croissants, put a tablespoon of frangipane (recipe in my previous post) at the base of the croissant triangle and roll as for ordinary croissants. Scatter some flaked almonds on the top before baking. When you are ready to shape the croissants, line 2 or 3 baking trays with baking paper. Put the dough on a lightly floured surface and roll out to a rectangle, a little more than 42cm long and 30cm wide; it should be about 7mm thick. Trim the edges to neaten them. Cut the rectangle lengthways into 2 strips, then cut triangles along the length of each strip; these should be 12cm wide at the base and about 15cm high (from the middle of the base to the tip). Once you have cut the first triangle, you can use it as a template for the rest. You should get 6 triangles from each strip. Before rolling, hold down the wide base of the triangle and gently tug the opposite thin end to cause a slight tension in the dough. 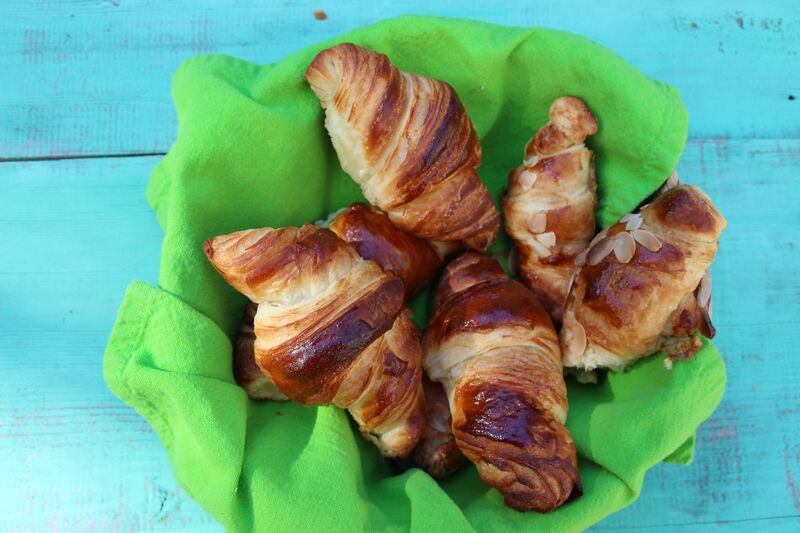 Now starting at the thick end of the triangle, roll up into a croissant. You will have 12 medium-sized croissants. For a traditional crescent shape, turn the ends in towards each other slightly. Put the croissants on the prepared baking trays, leaving space in between them to expand; allow 4 – 6 per tray. Put each tray inside a clean plastic bag and leave the croissants to rise at cool room temperature (18 – 24°C) until at least doubled in size. This should take about 2 hours. Lightly whisk the egg with a pinch of salt to make an egg wash. Brush the top and sides of the croissants with the eggwash. Bake for 15 – 20 minutes or until golden brown. Cool on a wire rack. Eat warm. 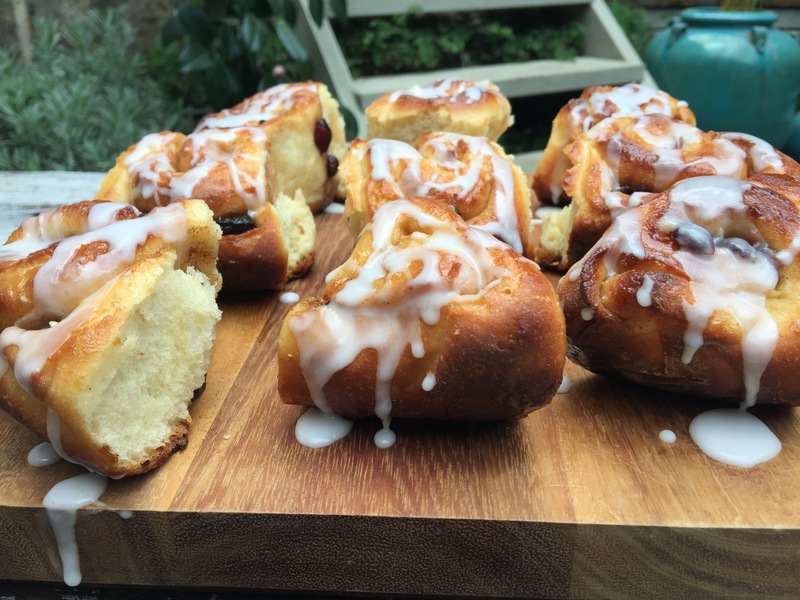 Posted in Breakfast, Buns and Scrolls, Cakes, Dessert, Small Baked Things, Sweet Food and tagged afternoon tea, almond croissants, berries, croissant dough, danish pastries, frangipane, Great British Bakeoff, pains aux raisins, Paul Hollywood, raisins. Bookmark the permalink. I’m on a long holiday at the moment which has given me the time for lots of experimental cooking. I love pastry so learning how to make laminated pastry seemed appropriate. It’s a lengthy but not difficult process – you just need some uninterrupted time and lots of patience! 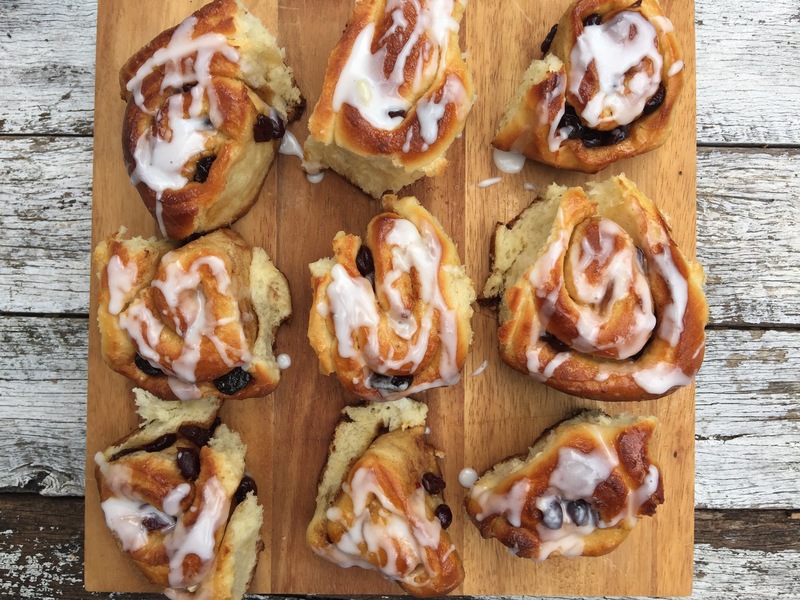 I can thoroughly recommend his step by step guide to making Danish pastry dough complete with excellent pictures as well as his individual recipes. 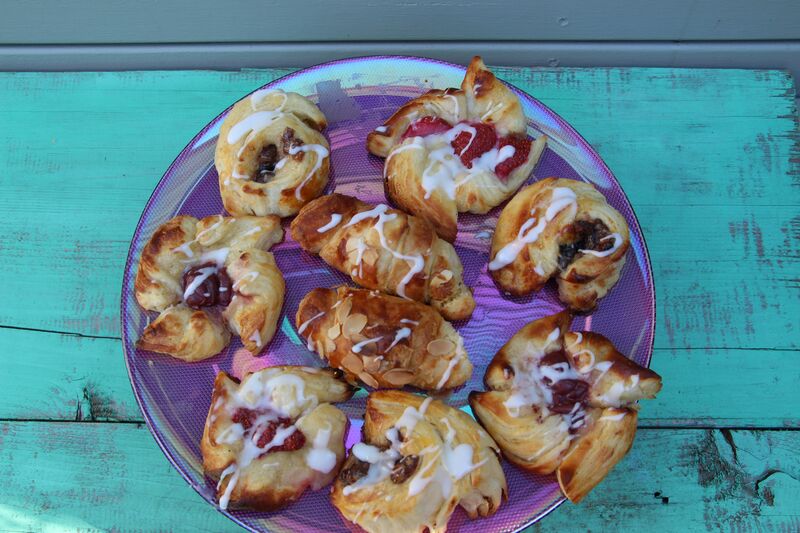 I made the basic dough and then created Pain aux Raisins, Almond Pastries and Berry Danishes as three sweet and delicious pastry morsels. I have also included the recipes for crème pâtissière and frangipane, typical pastry fillings. Put the flour into the bowl of a mixer fitted with a dough hook. Add the salt and sugar to one side of the bowl and the yeast to the other. Add the eggs, water and milk and mix on a slow speed for 2 minutes, then on a medium speed for 6 minutes. Tip the flour out onto a lightly floured surface and shape into a ball. Dust with flour, put into a clean plastic bag and chill in the fridge for an hour. On a lightly floured surface, roll out your chilled dough to a rectangle, about 50 x 20cm and about 1cm thick. Flatten the butter to a rectangle, about 33 x 19cm, by bashing it with a rolling pin. Lay the butter on the dough so that it covers the bottom two-thirds of it. Make sure that it is positioned neatly and comes almost to the edges. Take the dough out of the bag and put it on the lightly floured surface with the short end towards you. Now roll it out to a rectangle, about 50 x 20cm, as before. This time fold up one-third of the dough and then fold the top third down on top. This is called a single turn. Put the dough back in the plastic bag and chill for another hour. Repeat this stage twice more, putting the dough back into the fridge between turns. I divided the dough into three, using a third for each pastry type. Roll the dough on a lightly floured surface to a large rectangle, about 7mm thick. Turn it 90°, if necessary, so a long edge is facing you. Smear half the crème pâtissière over the dough, leaving a clear 5cm margin along the near edge. Sprinkle half the raisins and cinnamon over the crème. Roll the dough towards you into a sausage, keeping it as tight as possible – give a gentle tug each time you roll to tighten the dough and give it a little tension. When you reach the end, roll the sausage back and forth a few times to seal the join. Cut the roll into 3cm slices. Lay cut side up and apart on the baking trays and put each inside a clean plastic bag. Leave to rise at cool room temperature (18 – 24 degrees C) until at least doubled in size, about 2 hours. 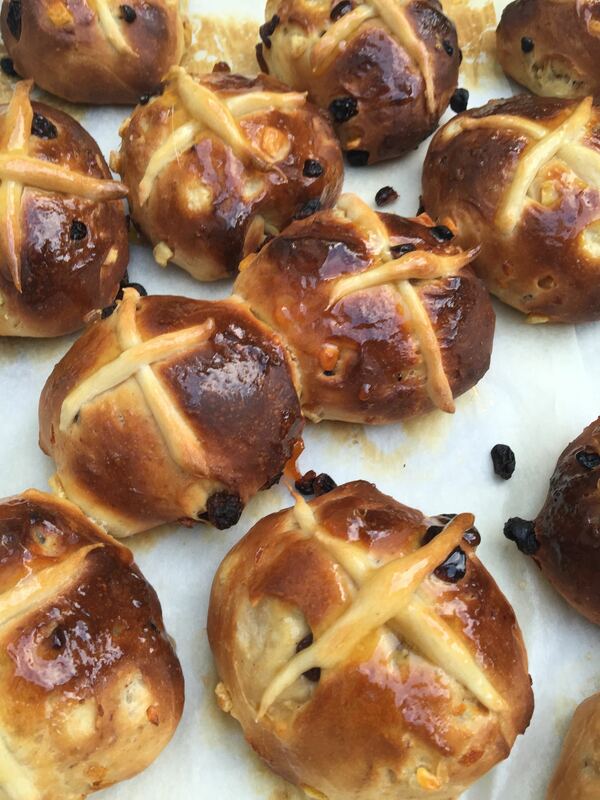 Heat your oven to 200 degrees C. Brush the risen pastries with beaten egg and bake for 15 – 20 minutes or golden brown. Paul glazes with apricot jam and drizzles with lemon icing. I left them plain this time. On a lightly floured surface, roll dough to a 20cm square, approximately 5mm thick. Cut into 10cm squares. If you make them a little smaller, and roll the dough a fraction bigger, you can squeeze 6 out of the dough. Fold the corners into the middle and press down lightly with your finger so the fold sticks. Put the pastries onto the baking tray, spacing them apart. Put the tray into a clean plastic bag, leaving to rise at cool room temperature (18 – 24 degrees C) until doubled in size, about 2 hours. 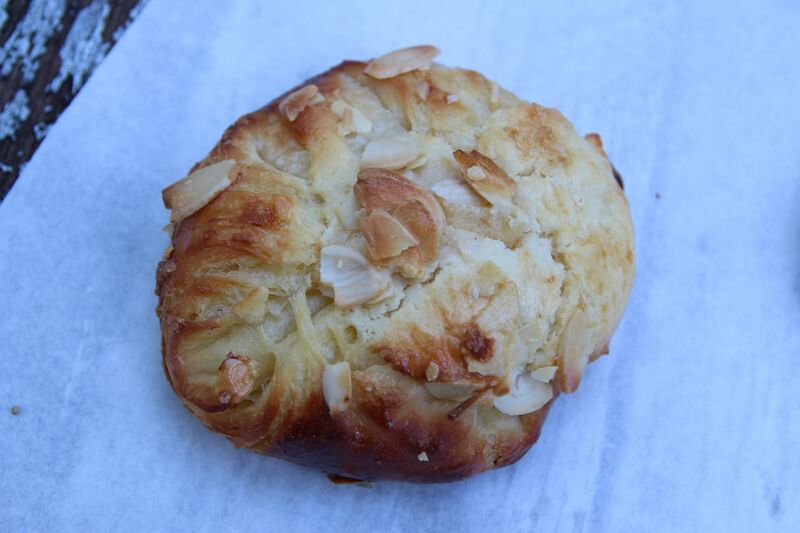 Place about 1tbsp of frangipane in the middle of each risen pastry and sprinkle with flaked almonds. Brush the pastry with beaten egg and bake for 15 – 20 minutes or until risen and golden brown. Paul glazes with apricot jam and optionally drizzles with orange icing. Again, I left them plain this time. On a lightly floured surface, roll dough to a rectangle, about 30 x15cm and approximately 7mm thick. Cut into 7cm squares. on eaxc square, make cuts from each corner going diagonally almost to the centre so you have 4 triangles. Fold one corner from each triangle into the centre to create a star shape. Put the stars onto the baking tray, spacing them apart to allow room for spreading. Put the tray into a clean plastic bag, leaving to rise at cool room temperature (18 – 24 degrees C) until doubled in size, about 2 hours. 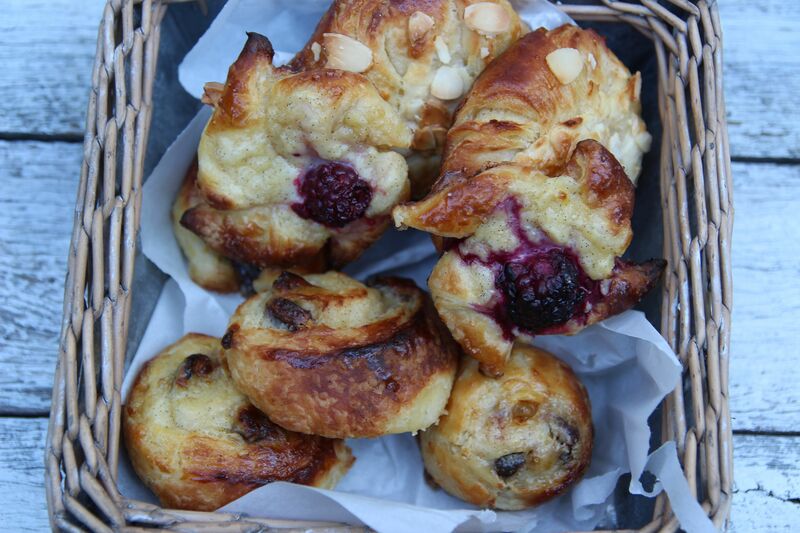 Put 1tbsp of crème pâtissière in the middle of each risen pastry and top with a couple of berries. Brush the pastry with beaten egg and bake for 15 – 20 minutes or until golden brown. Paul glazes with apricot jam and drizzles with lemon icing. I left them plain. Remove from the heat and pass the mixture through a sieve into a clean bowl. Add the butter and stir until melted and thoroughly combined. Leave to cool, cover with clingfilm and then chill before using. Put the butter and sugar into a food processor and cream until light and fluffy. Add the eggs and one tablespoon of flour and mix well. Add the remaining flour, ground almonds, baking powder and almond extract and process until combined. Chill before using to make it easier to shape. 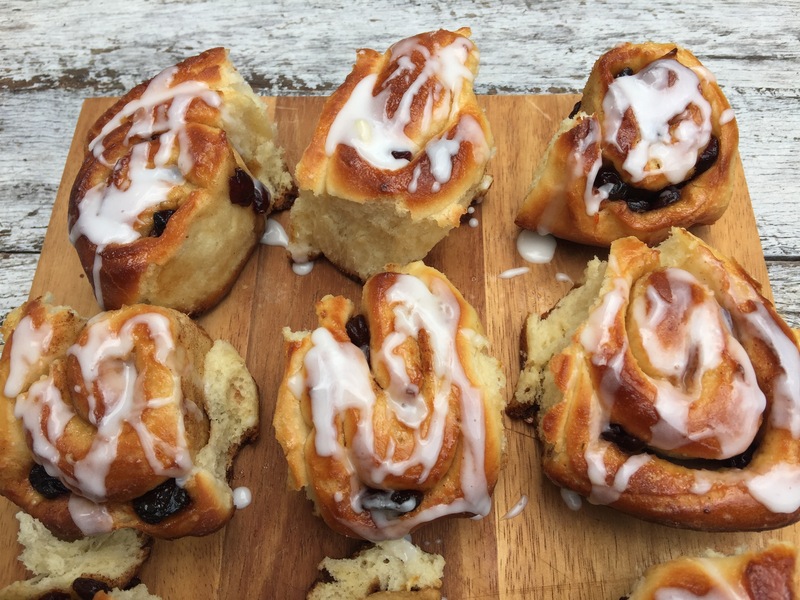 Posted in Breakfast, Buns and Scrolls, Cakes, Small Baked Things, Sweet Food and tagged almonds, berries, crème pâtissière, Danish pastry, frangipane, laminated dough, pain aux raisins, Paul Hollywood. Bookmark the permalink.